Serum enables you to 'visualise' your tweaking. 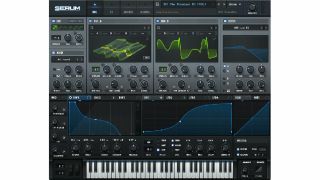 Xfer Records says that Serum, its new cross-platform plugin synth, was created because a "dream synthesizer" of its ilk simply didn't previously exist. It promises "a truly high-quality sound," and a "visual and creative workflow-oriented interface to make creating and altering sounds fun instead of tedious"
This is a wavetable instrument, but one with a built-in editor that enables you to create your own own wavetables in a variety of ways. The "ultra clean" oscillators are said to be free of audible artefacts, and there's a drag 'n' drop modulation system. Other options include realtime wavetable manipulation (there's a graph editor so that you can do this visually), a wide range of filter types, a comprehensive rack of effects and a Unison mode that enables you to stack a single oscillator to use up to 16 voices. Serum is available now in VST/AU/AAX formats from the Xfer Records website. Head over there to find out more and download a demo. It's currently priced at $129.